Samsung Electronics, the world leader in advanced memory technology, announced that it is now mass producing the industry’s first 256-gigabyte (GB) embedded memory based on the Universal Flash Storage (UFS) 2.0 standard, for next-generation high-end mobile devices. The newly introduced embedded memory features outstanding performance for mobile devices that exceeds that of a typical SATA-based SSD for PCs. 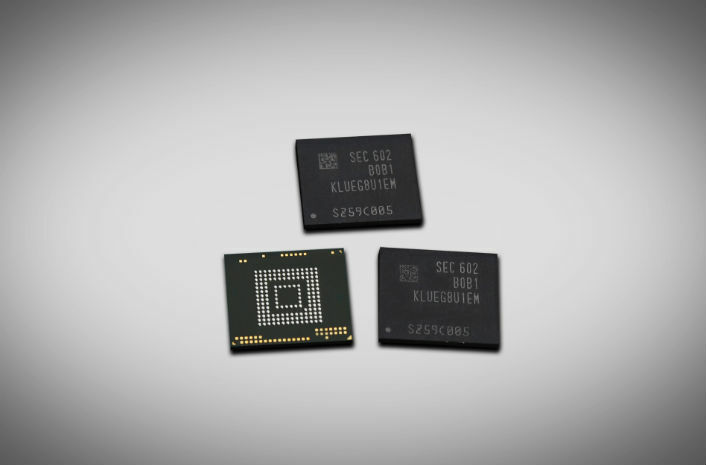 The new Samsung UFS memory satisfies needs for ultra-fast speed, large data capacity and compact chip size in high-end smartphones. It is based on the company’s most advanced V-NAND flash memory chips and a specially-designed high-performance controller. The UFS memory handles up to 45,000 and 40,000 input/output operations per second (IOPS) for random reading and writing respectively, over two times faster than the 19,000 and 14,000 IOPS of the previous generation of UFS memory. In addition, with the advent of next-generation smartphones that support the USB 3.0 interface, users will be able to transfer data much faster between mobile devices. The USB 3.0 interface will allow sending a 5GB-equivalent Full-HD video clip (average 90-min. movie size) in 12 seconds. Within this new storage environment, mobile users will get to take full advantage of the performance benefits of Samsung’s latest UFS memory. Using Samsung’s advanced memory technology, the new UFS memory chips are extremely compact, even smaller than an external micro SD card, giving greater flexibility to smartphone designers.